Affiliation: MAGRAMA. Servicio de Inventario Forestal, Dirección General de Desarrollo Rural y Política Forestal, Subdirección General de Silvicultura y Montes. Andalusia is one of Europe's most biologically diverse regions due to its geographical position, its large size and its particular climatic, topographical and historical conditions. 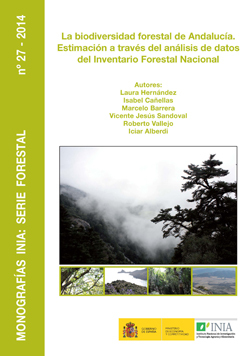 This book examines the state of the biodiversity associated with the main forest types of this region from the data collected in the Third National Forest Inventory and using a group of indicators related to naturalness, species composition, structural diversity, frequency of biotic/ anthropic elements and the presence of epiphytic lichens. The combined analysis of these indicators shows Quercus canariensis forests, cork oak forests, pinsapo fir forests, black pine forests, riparian forests and mixed forests as the ecosystems supporting greater biodiversity. These results enhance the interest of ensuring the conservation of the goods and services associated with these ecosystems, supporting the current conservation measures aimed to safeguard many of these forests. Furthermore, the presentation of mean values and thresholds of different biodiversity indicators for Andalusian forests has an important value of technical implementation for the sustainable management of the goods and services associated with these ecosystems. This book was added to our online catalog on Friday 17 October, 2014.